Secrecy For Sale: Inside The Global Offshore Money Maze is one of the largest and most complex cross border investigative projects in journalism history. For the initial stages of the project, The International Consortium of Investigative Journalists collaborated with more than 110 journalists in 58 countries in an attempt to strip away the biggest mystery associated with tax havens: the owners of anonymous companies. Since then, more datasets have been investigated and more journalists added to the project. Our aim is to allow the public to see inside the offshore world in a way that has never before been possible. Perhaps most surprising is that much of what we will be revealing over the next few months is perfectly legal. The extreme secrecy offered by tax havens also facilitates the use of anonymous entities to commit crimes, evade taxes, hide assets from creditors and avoid regulations. This secrecy can ultimately undermine democracy by granting a certain class of individuals the ability to play by a different set of rules. One of the main investigative tools we are using – and which was donated to us free-of-charge – is specialist software from the Australian-based company NUIX, which allows for the processing, managing and searching of large volumes of unstructured data. The initial reporting on this project was based on 2.5 million secret files related to 10 offshore centers. The files contain detail on more than 120,000 offshore companies and trusts and nearly 130,000 individuals and agents, in more than 170 countries. Since then, the project has grown to also include additional leaked datasets revealing further details about offshore holdings. Nicky Hager (Assistant Project Manager), Mar Cabra (Data Research Manager), Duncan Campbell (Data Journalism Manager), Stefan Candea (Assistant Project Manager), Tom Stites (Contributing Editor), Kat Aaron (Contributing Editor), Peter Newbatt Smith (Fact Checker). 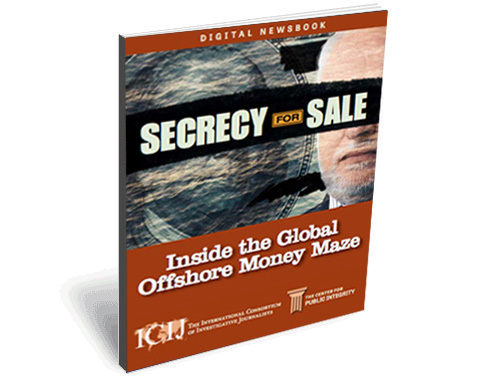 View ICIJ’s “Secrecy for Sale: Inside the Global Offshore Money Maze” investigation in PDF format, or for the best reading experience, save and open the e-book within a PDF viewer on your media tablet, e-reader or personal computer. For Apple iPad owners we recommend opening the e-book in the iBooks or Goodreader apps.